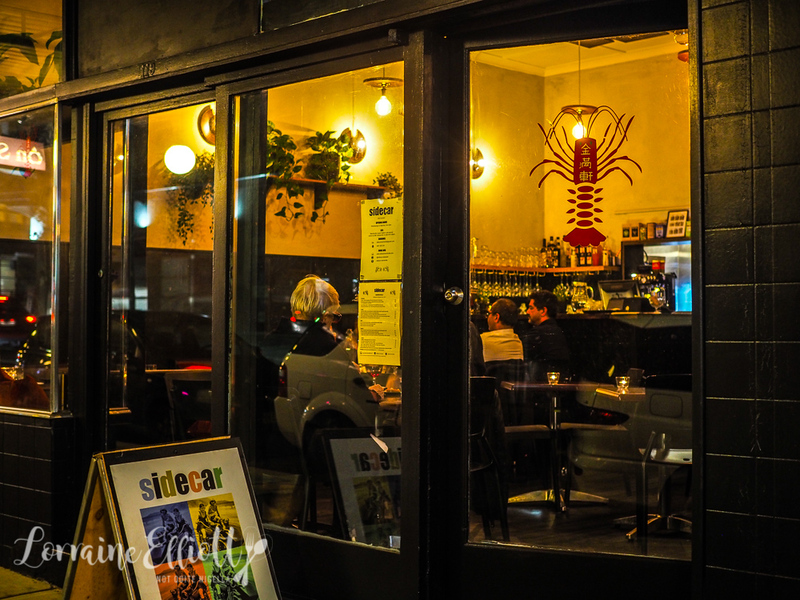 A cosy neighbourhood restaurant on Marrickville Road, Sidecar is the new baby sister restaurant to Gasoline Pony (get it? The motorcycle and the sidecar?). 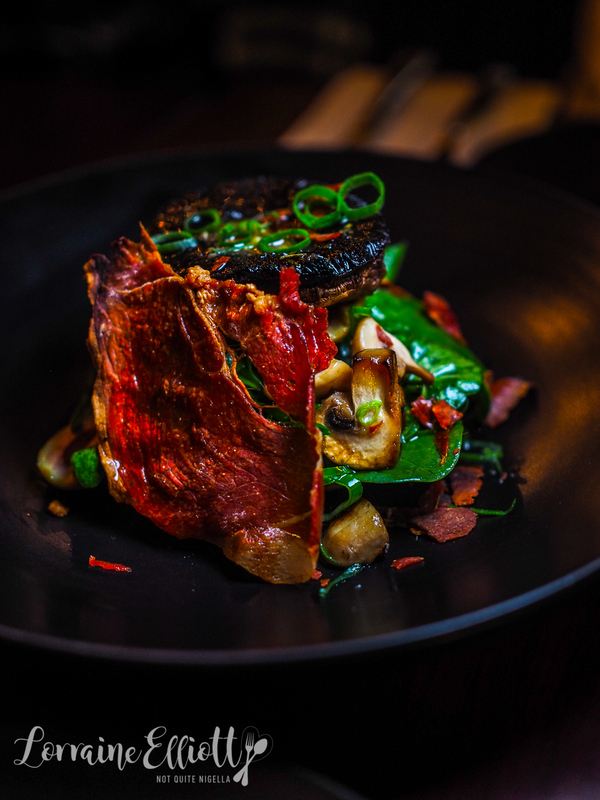 There is a good range of vegetarian, vegan and gluten free offerings on the menu and for the moment it is BYO. Full disclosure Dear Readers: the chef that developed the recipes for Sidecar is my friend Tania. Although we haven't seen each other in years, I was happy to hear from her. She is stepping back and handing the reins to another chef. I also figured that the people to go with are Celia and Pete (Tania, Celia, Rebecca and Charlie helped me enormously during my book launch years ago). Sidecar is also BYO with a liquor license to come. Service is very friendly and we are sitting on the window seat. The menu has some vegetarian, vegan and gluten free options. Did I mention how hilarious and cheeky Celia is? While we are reading the menu she confesses that every time she sees "gf" on the menu, she reads it to mean, "get f$^%ed!". And her favourite part is when she reads there are certain items that say "Gf on request". "Is that when you pay them to abuse you?" she guffaws. She actually has several friends with celiac disease and thinks that they often get a raw deal. 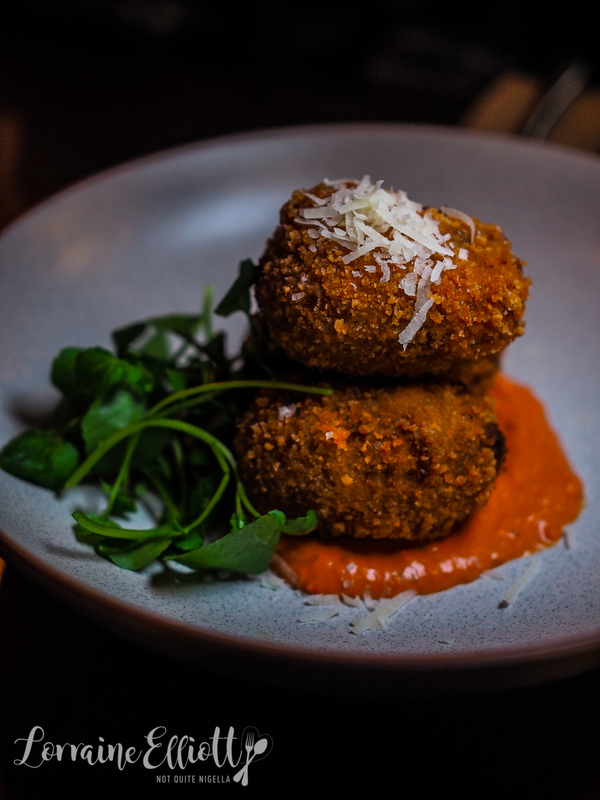 We share two starters-the croquettes are crunchy crumbed and filled with porcini risotto and sit on a bed of sun dried tomato aioli. They're moreish and I wish we had one per person. The mushroom tart is a very popular entree. It's a paper thin tart case with beetroot, quartered mushrooms, whipped feta and a shard of crispy roasted prosciutto. The flavours go well together and it's good even if you don't have the prosciutto (although it's great with it, if you know what I mean). Celia is a big fan of the steak as she loves Cape Grim grass fed beef. The steak is topped with garlic butter roasted carrots. 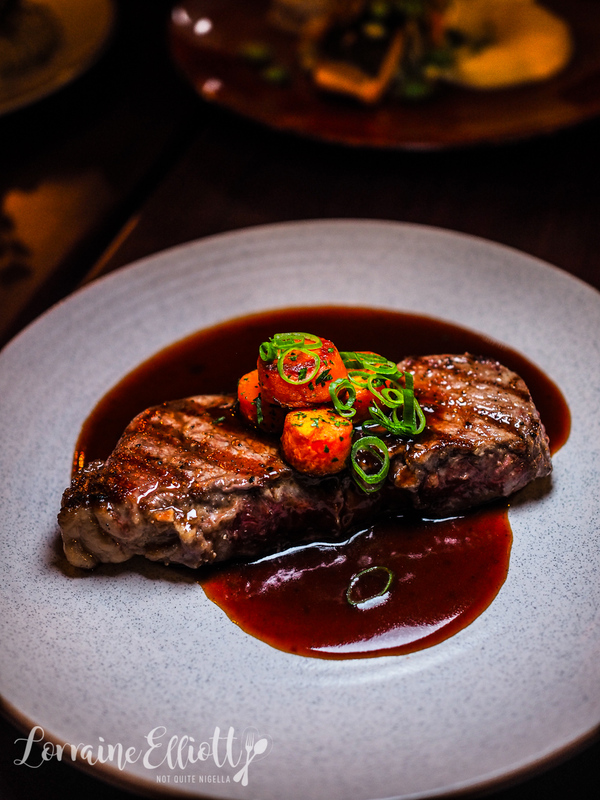 It comes with a glossy, slightly sticky red wine balsamic reduction and is cooked perfectly medium rare. 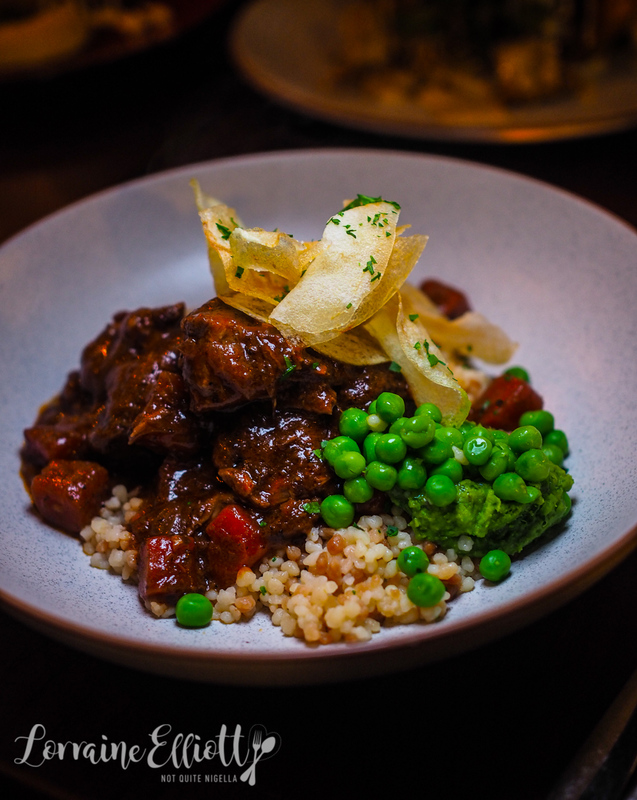 The lamb is a favourite of mine especially because of the minted peas and fregola pasta as well as the abundance of that rich sauce. 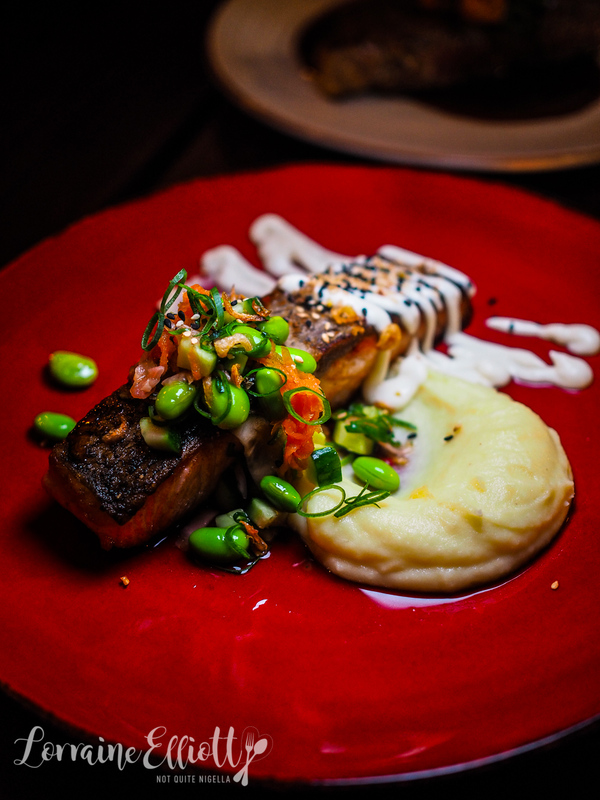 I really like the Asian flavours of the salmon fillet as well as the texture of the salmon which is cooked so that it is still luscious. And the miso mash? Heaven. My two favourite mains were the salmon and the vegan offering. 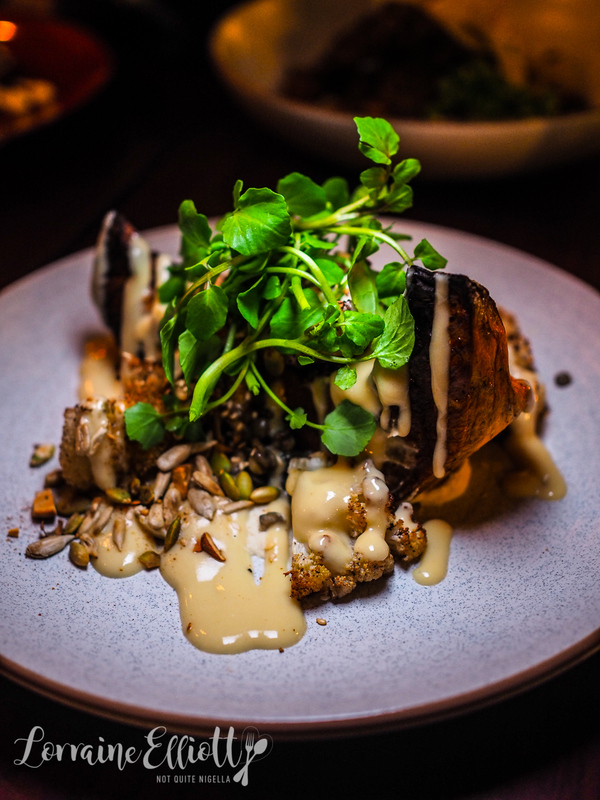 Sometimes vegan food can lack flavour and texture but the roast pumpkin wedge with spiced cauliflower and lots of nubbly lentils is brought together with a silky cashew cream and an umami miso dressing. 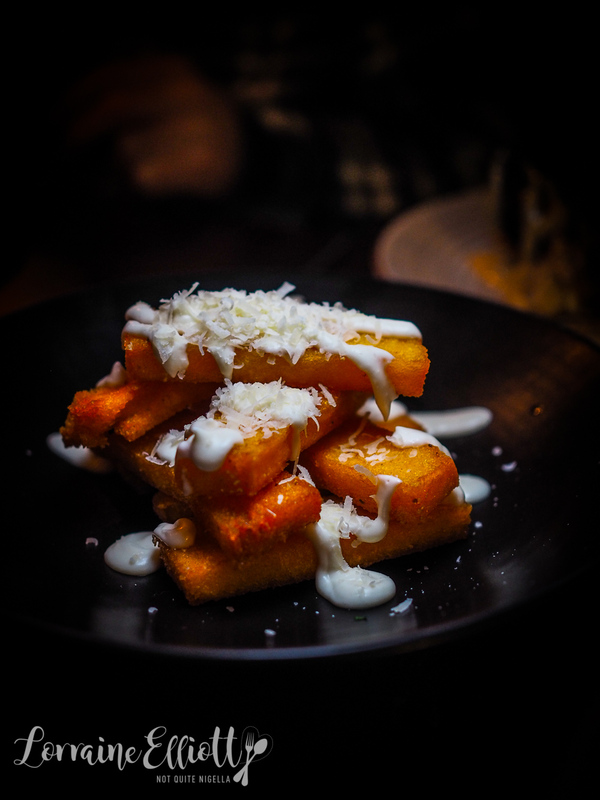 Sometimes polenta chips can be disappointing. They are either not crispy enough or not flavoursome enough. These are super crunchy and full of flavour in both the chip itself and the garlicky aioli. Tania tells us that the aioli is a vegan one too (although the parmesan is regular cheese that prevents the whole dish from being vegan). We decide to split two desserts. 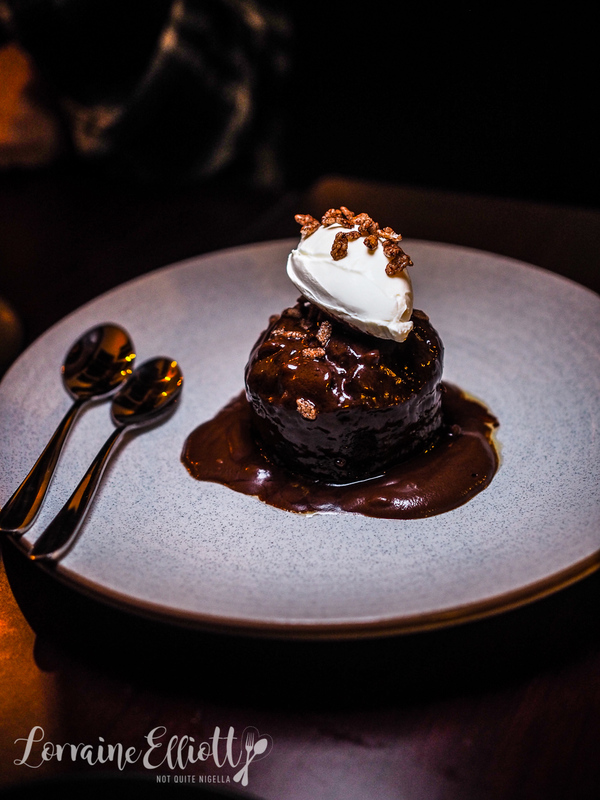 The warm chocolate zucchini cake is good but the peanut chocolate sauce (which has so much potential for deliciousness) is a little unusual. While the vanilla cheesecake is nice and creamy but the chocolate biscuit layer on the bottom is a bit hard to get out of the glass. The caramel also has a pronounced saltiness to it which I like but others are not so keen on. 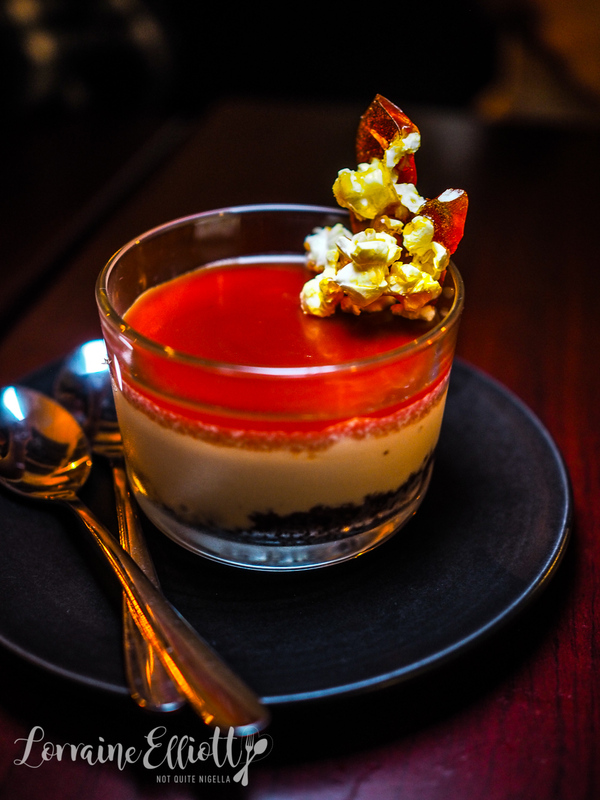 I do like the caramel and popcorn praline on the side though. So tell me Dear Reader, do you see the same thing when you read "GF"? And do you often look for vegetarian, vegan or gluten free friendly menus? 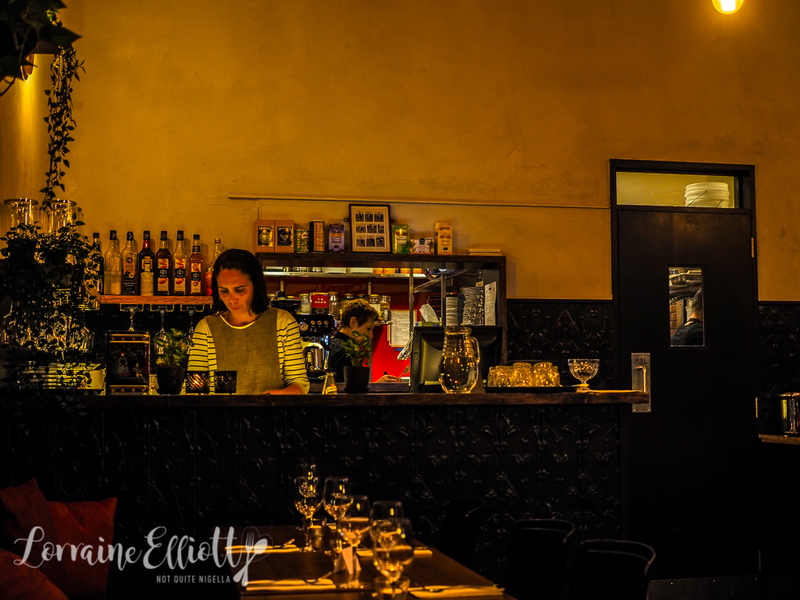 restaurantBach Eatery, Newtown for a Birthday Dinner to Remember! 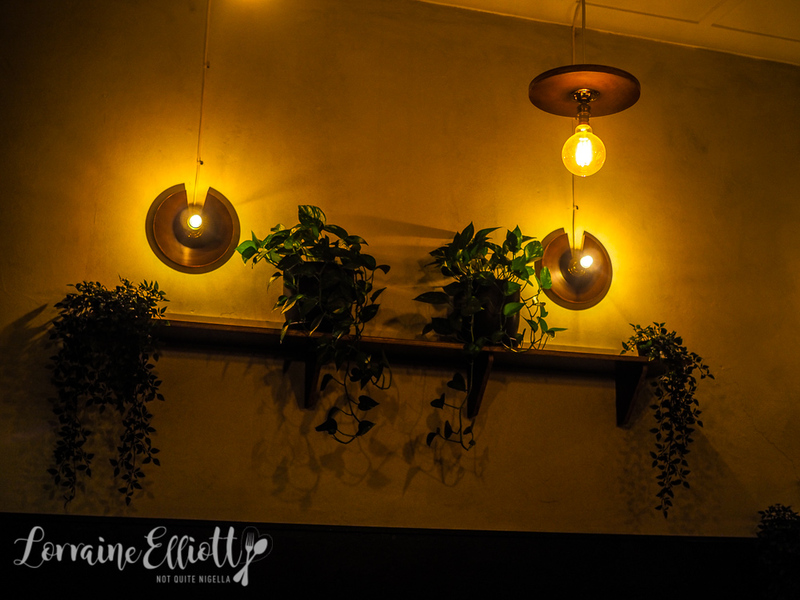 restaurant Bach Eatery, Newtown for a Birthday Dinner to Remember!